Get your pond off to a great start by adding the CareFree Pond Builder Starter to it. Specially formulated with nitrifying bacteria, this product establishes a healthy growth of indigenous bacteria in your biological filter. The unique blend of bacteria, nutrients, and pH buffering compounds easily removes ammonia and nitrates in your water, establishing a balanced pond, and also curtails green water problems. This product also helps condition fish coats and reduces aquatic stress, for physical vigor and vitality in your fish. Add the appropriate amount of this liquid to a gallon of your pond water and dispense it evenly around your waterscape. This 16 ounce bottle will treat a pond up to 3,000 gallons, and may be used weekly on smaller features. For best results, use this product in conjunction with the CareFree Pond and Fountain Protector for clean water and a wonderful ecosystem. The non toxic, biodegradable blend is safe for use with all plants, marine, and animal life, for environmentally friendly control. 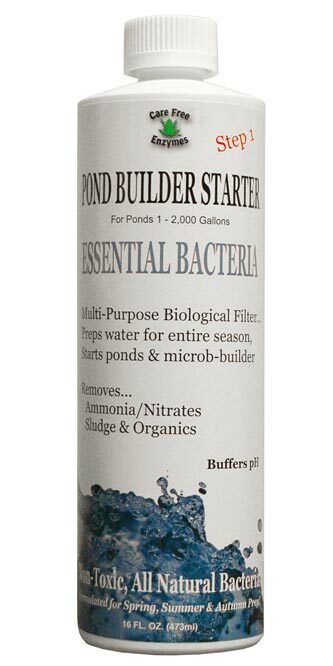 Help your existing pond stay beautiful and clean with this Pond Builder Starter. Made in the USA.